Each January, International Partners and the University of Maryland bring a group of UMD students to El Salvador to work with one of IP’s partner communities. This past January, a group of 8 graduate and undergraduate students, spent two weeks in the village of Palo Grande. During the day, the UMD delegates worked in the biblioteca (education center) supporting the facilitator, Aminta. They spent time using games with the children to practice math, basic English phrases, and reading. They also worked with students to write poems or create pieces of art. In the final week, several delegates helped students create and publish a newsletter about Palo Grande, which they then distributed throughout the village. Each UMD student also completed a small research project. The projects included themes of learning about people’s experiences during the Civil War, local government structure, the upcoming presidential election, and perspectives on the education system in the country. These projects allowed not only for the opportunity to learn more about the country, but also allowed for the strengthening of relationships with a variety of community members both young and old. 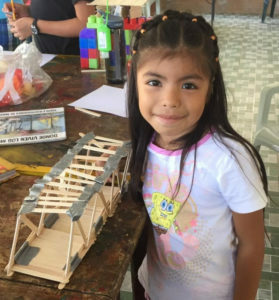 When delegates were not working in the bibliotecas or on their projects, they spent time with community members and learned about community of Palo Grande. One morning they visited a milpa (corn farm) with Tio Pepe and then spent time husking corn. They also got multiple opportunities to hear testimonies from people impacted by the Civil War. On the weekend, delegates and community members spent a day in Suchitoto and took a boat ride on Lake Suchitlan. During the evenings, the delegates got to enjoy the company of the larger community through a game night, a talent show, a food exchange, and a baile (dance). Palo Grande, as a community, opened its arms to the delegation, individuals opened their homes, and at the end of the two week the delegates and community members left with a deep, mutual affection for each other — an affection that sustains global, human development. International Partners con su programa de delegaciones, nuevamente hizo su acción de ayuda humanitaria en El Salvador. En esta ocasión 8 delegadas visitaron por dos semanas la comunidad Palo Grande del Municipio de Suchitoto. 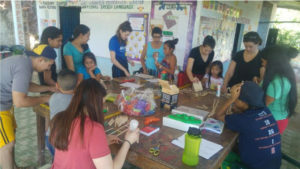 El trabajo que desarrollaron fue en el área Educativa en participación directa con la ADESCO y comité de apoyo en una de cinco bibliotecas que International Partners financia en El Salvador. Tuvieron un involucramiento directo en la planificación y el desarrollo de las actividades durante las dos semanas; además de tener una experiencia única con las familias durante su estadía, tuvieron la oportunidad de interactuar diariamente con niños/as, jóvenes y adultos compartiendo su conocimiento en Matemáticas, Inglés, Arte, Lectura, Computación y Apoyo Escolar por medio de juegos; también, tuvieron la oportunidad de comer la comida típica de El Salvador, conocer físicamente los diferentes sectores de la comunidad, tuvieron muchos momentos de diversión, historia, aprendizaje, conexión con la vida de la gente, aprender sobre sus costumbres, experiencias de la guerra en El Salvador y sobre las actividades de vida cotidiana. La comunidad estuvo satisfecha por la visita de la delegación, ya que esto les permite aprender y desarrollar más el conocimiento de niños jóvenes y adultos y por ende el desarrollo de su comunidad. Gracias a este programa impulsado por International Partners, personas de los EEUU y El salvador, pueden conocer e interactuar con sus culturas y mantener lazos de hermandad que conllevan a un mejor desarrollo social.